THERE must be a problem in Scotland when a man working towards “a better atmosphere, not a bitter atmosphere” has to endure threats and intimidation. There can be no denying that there are small, but persistent areas of Scottish society that don’t want an end to Scotland’s shame. Bigotry is deep rooted in Scotland and despite its old age it’s keeping up with the modern world just fine, presenting its full brutality and ignorance through new mediums like Facebook and Twitter. But there is one man battling against the tide, and Colin Dolan is unapologetic for it. “They just don’t like me. They don’t like our page. They don’t like our attitude,” said Dolan, founder of Facebook page Rid The Old Firm Bigotry Once And For All. “There’s a lot of people who think we as a group are looking for attention. But with over 3,500 members on a page that has a vision that one day things can be different, Dolan doesn’t put any focus on the gritty side of the job. It’s all about the positives for him and his team on Rid The Old Firm Bigotry and their achievements on making people think about what they write online and the views they hold. There is an appetite for Dolan’s approach. 2011 became one of the most shameful years in decades for Scottish football after Celtic boss Neil Lennon, the late Paul McBride QC and MSP Trish Godman were sent parcels which allegedly contained potentially viable explosive devices. Two men are currently on trial at the High Court in Glasgow charged with the crime. The year also saw the Old Firm “shame game” at which tempers flared between Rangers and Celtic managers Ally McCoist and Neil Lennon. In 2008 Irish authorities raised concerns with the Scottish government over the “Famine Song”, a chant used by Rangers fans, in which people of Irish descent in Scotland are told “the famine’s over, why don’t you go home?”. In 2009 the Justiciary Appeal Court in Edinburgh declared the song racist after Rangers fan William Walls appealed his conviction for racially-aggravated breach of the peace. The court ruled he had been rightfully convicted after singing the famine song. In 2010-11 there were 696 criminal cases involving a religious aggravation charge brought to Scottish courts. Football was involved in 231 of those charges and the vast majority of cases were in the west of Scotland. A number of cases involving social networking sites have passed through the Scottish justice system in the last year. The blight of bigotry does not seem to be lifting, but for all those actively taking part in it, there are plenty who are ready to start shouting louder than the bigots. Dolan set the page up almost a year ago after being sickened by some of the “banter” he was witnessing on Facebook pages. He was living in Madrid at the time and used the internet to keep up-to-date with Scottish football. Running with slogans like “creating a better atmostphere, not a bitter atmosphere” and “rivals, not enemies” the page has fought a hard battle against doubters since its launch. “We had negativity at first,” Dolan admitted. “People saying it would never work. People saying it’s what keeps Celtic and Rangers going, which is utter rubbish. “We had doubters. We have people say you will fall at the first hurdle. That reaction made me more determined. 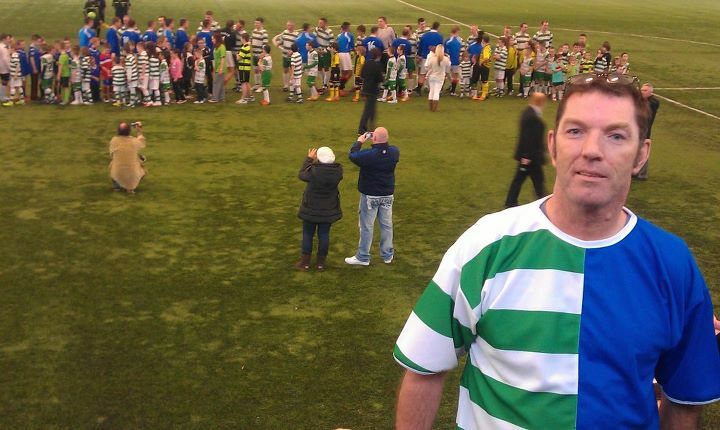 The efforts of Dolan and the rest of the volunteers at Rid The Old Firm Bigotry attracted the attention of another organisation, Old Firm Legends, who organise football games involving a mixture of ex-Celtic and Rangers players and fans. 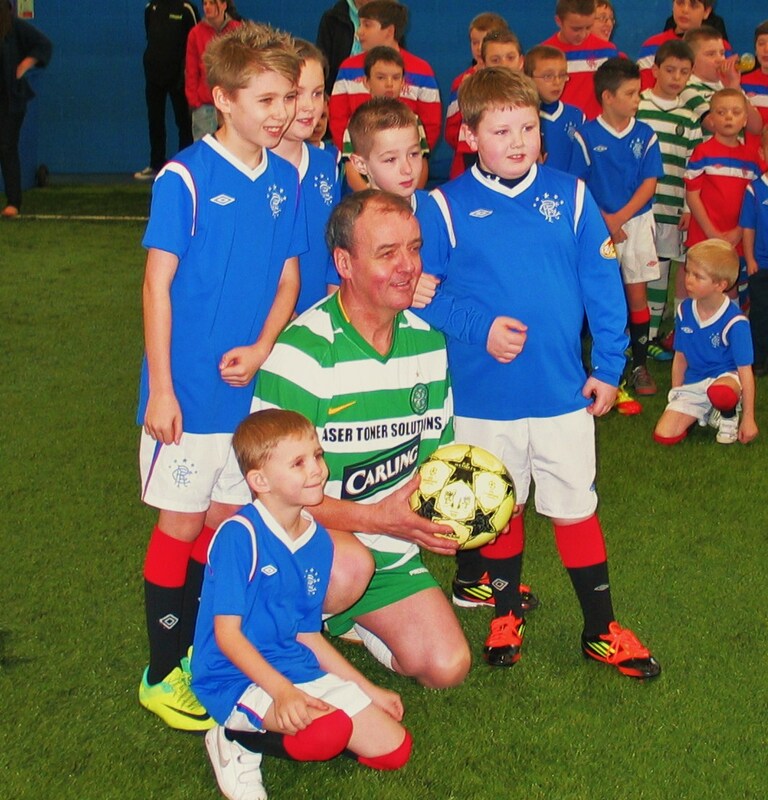 The proceeds of the events are shared between a range of Scottish charities and, working alongside Rid The Old Firm Bigotry, the games promote a strong anti-bigotry message. Former Celtic player, Frank McGarvey, regularly takes part in the Old Firm Legends matches, and his views on the subject of bigotry are very clear. McGarvey believes the bigotry problem must be dealt with at an in-house level as well as with the help of government and authorities. “It has to be done in-house for me and I started at that game,” he said. “In that 5-asides I have not been called anything because I have stood up to it and said no I’m not accepting that anymore and that’s what we have all got to do. We have all got a responsibility. “This SNP government are doing the best they can about it and the police are doing the best they can about it but they have no control, it has to be done in-house. Dolan believes Rid The Old Firm Bigotry can make a real difference and the association with Old Firm Legends has provided the organisation with a new, and important, audience – the next generation. “The most important thing for me is the children,” Dolan said. “We want them to see these people getting on and having a laugh. Dolan and the team behind Rid The Old Firm Bigotry have now launched an official website and have begun production on a regular newsletter. You can visit the website at http://www.oldfirmfriends.com.